Freedom in jazz improvisation comes from understanding structure. When people listen to jazz, they often believe that the soloist is �doing whatever they want.� If fact, as experienced improvisers will tell you, the soloist is rarely �doing whatever they want�. An improvisational soloist is always following a complicated set of rules and being creative within the context of those rules. Recognizing the rules and structure in different art forms can be challenging. I can remember times in class when I showed students famous artwork to illustrate points. On many occasions, students I�ve worked with have looked at the works of Picasso and said �I could paint that.� Perhaps they could? The work of Picasso, like all great artists, must be taken in context. At one point in his life, Picasso chose to do simple geometric drawings. Despite the fact that he spent the early part of his life developing incredible painting technique by copying the great masters, in the end, he chose to create much simpler art. The greatness of his work is viewed in the context in which this choice was made. Could a child copy a Picasso? Yes. Would it be an important artwork? No. The structure underlying the art adds value to the work. The same can be said when young students first hear the music of jazz improvisational greats. Often, when my students first hear John Coltrane, they are overwhelmed at the complexity of what they hear. They can hear emotion and stylistic depth in his playing but fail to recognize the harmonic and rhythmic complexity of his work. When they try to emulate Coltrane, they focus on the technical aspect of his playing. They learn an important lesson. 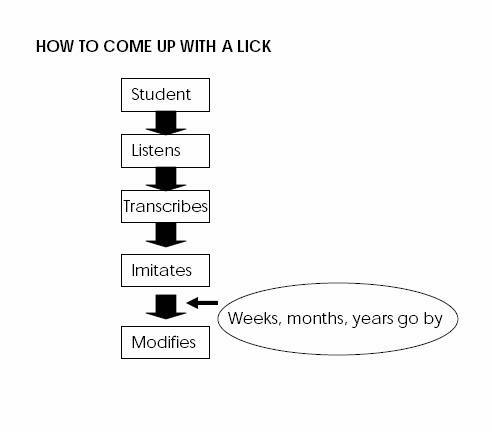 Copying licks will not make you a great improviser. Only by learning how to use the licks within an improvisational melodic structure, can an improviser move from repetition to communication. In the field of jazz improvisation a great deal of attention is paid to harmonic structure. Thousands of books and workbooks have been written to help students learn the complicated structures of harmony that enable improvisational soloists to communicate their art. Harmonic structure is an important aspect of jazz improvisation. Harmonic structures are the colors that jazz improvisers paint with. But harmonic structures are not the only structures that improvisers must know. Equally important to these harmonic structures are Improvisation Melodic Structures. Improvisational Melodic Structures are phrases of certain length, placement, and shape that are found throughout improvised jazz. Melodic structures are not quite as easy to distinguish as harmonic structures. Melodic structures are often hidden within the context of a solo and its phrasing. Every improviser has been told that in order to �really� play jazz, they must spend a lot of time listening to it. Have you ever wondered why? Part of the reason is that most improvisers have learned melodic structures through unconscious imitation. During hours of listening, copying, transcribing, and playing, musicians have taught themselves melodic structures. I believe that this time tested way is the best long term way for musicians to learn to improvise, but I also believe that as educators we are failing our students by not offering comprehensive instruction on the creation of improvisational melodic structures. Melodic structures help the student better understand the art of communication through improvisation. Melodic structures create the template that the student needs to begin experimenting with harmony and creating an educated solo. Improvisational Melodic Structures exist at very beginning of improvisation. They are the most basic structures that help us discover our own ability to creatively improvise. In the beginning, teaching improvisation is easy. Students love to explore their instruments and create new sounds. Their fear of judgment is slightly repressed and the process of exploration and discovery is thrilling enough to make them want to practice. But along the way something changes in music students. In the years that I have been teaching improvisation, I have noticed that as students become more advanced, they become more hesitant about improvisation. It�s a dilemma. The beginner, who is unaware of the complex rules of improvisation is often able to create solos that are wrought with raw emotion and creativity, while the advanced student, who may have years of harmonic training, is often paralyzed by the complex rules of improvisation and is unable to play a thing! Over the years, I�ve been to clinics, festivals, and have had thousands of conversations with both teachers and students. I�ve noticed some patterns and trends in music education. First, today�s music students play great! Music teachers nationally are doing a superb job of getting students to play and keeping them excited. Students today are technically more proficient and harmonically more educated than I have ever seen. They may be better than at any point in history. Second, despite the fact that many students are technically proficient at their instrument, they don�t improvise as well as possible. At every festival I attend, in almost every band I hear, one or two students do most of the soloing. These �star� students carry the improvisational burden for the others and typically play extremely well. What I have found is that the majority of students don�t improvise. This isn�t because they don�t want to improvise, but rather because think that they don�t think they improvise well. The �star� improvisers at each school tend to be the highly motivated students who accept the burden on learning to improvise on their own. Teaching improvisational melodic structures can help every student, not just the �star� improvisers, build a solo that is both creative and communicative. Jazz is a language and playing a solo is like telling a story. Music educators need to develop and nurture the skills that are needed to do this. Despite the fact that students have a better command of their instruments and are more technically proficient that ever before, very few improvise well. Teachers around the country should be asking themselves �How can I help all of my students improvise well?" One of the main reasons all students don�t improvise well is that educators teach too fast. Learning a language takes time. At its basic core, teaching improvisation is like teaching a language. The language of improvisation has grammar, structure, and dozens of dialects. There are many ways to learn a language, but strictly focusing on grammar is certainly one of the least interesting. Unfortunately, this is how we often teach improvisation. In the course of a semester students may learn a significant amount of harmonic concepts and then be given the chance to apply these harmonic concepts to a wide variety of compositions. Often, in the course of a semester, beginner students will play blues, rhythm changes, and several different jazz standards. The student will have learned that there is a great deal of variety in the world of jazz and that harmonic concepts can be used universally. The other thing that a student may have learned at the end of this semester is that jazz improvisation is really hard, very technical, and maybe not for them. We teach too fast. Teachers need to slow down. If our expectation is that all of our students will go home and practice for many hours every day, our expectations need to be adjusted. The students I teach have jobs, do volunteer work, study extremely hard, participate in extracurricular activities, play sports for fun, and would like to learn how to improvise well. In most cases they are not asking to learn the entire context of jazz harmony, though eventually they may, or every tune in the Real Book. They simply want to improvise well. I�ve come to realize the reason why only a few students from every band play in festivals play all of the solos. It is those few students who are willing to go home and practice for hours every day to TEACH THEMSELVES how to improvise. Music educators need to strive to make improvisation an attainable and accessible goal to all students. One of the reasons we teach too fast is obvious. There is so much important information to convey. When I work with students I often have to bite my tongue to keep from saying �and when we�re done with this we move on to this, and then to this, and THEN this stuff which is really important�. I have vivid memories of saying this to students and watching their eyes glaze over as the hope of success drains away. Instead of trying to teach everything that exists within the improvisational world, we should focus on teaching the things that we value. Instead of teaching facts we should strive to impart wisdom. Once a student has fundamental skills on an instrument, we should be extremely careful not to confuse quantity of information with quality of information. We should understand that most students will not go home and practice for hours every day. As educators we should develop a way to help them sound great and improvise well within a reasonable and flexible practice time. Most of the resources published to teach jazz improvisation focus on technique and playing the correct notes. Volumes on technical exercises, scale patterns, chord patterns, and licks fill jazz education libraries and dictate the curriculum of our jazz classes. Does it work? Given a motivated students, enough time, the positive habit of listening to a lot of jazz, yes it does work. Is focusing on harmony the best way to teach jazz improvisation? No. I answer definitively because for years I taught improvisation by focusing on harmony and for years the results were the same. Sometimes I would have a few motivated students who worked extremely hard to really understand improvisation and excel at it. These students would always win acclaim and awards and I would feel successful. But, over the years, most students did not excel at improvisation. I can remember many cases where students would practice hard, learn the harmony rules, know what scales to play, and when the time came to solo they would look at me and say �I don�t know what to play!� Despite their knowledge of harmony and their desire to improvise, they lacked the most basic understanding of how to create a melody. When teachers focus on teaching melody and phrasing processes instead of extensive harmony and transcription, two major things happen. First, the student generates an incredible amount of melodic ideas quickly. Some of the ideas will be good and many will not, but the student will have ownership of all of the ideas. Second, the student will have learned a process that can be applied in different contexts. In this way if they learn to create melody on a standard, they won�t have to wait until they play the standard again to use the licks they learned. They can apply the Improvisational Melodic Structure to other tunes in the same way. Harmony does play an important role in improvisation, but as students learn to solo we should not initially burden them with extensive harmonic knowledge. When we teach improvisation we need to slow down. We must use our experience and wisdom to tell students a few of their best harmonic options and teach them to play and think melodically. In upcoming articles and workbooks I will address the dozens of Improvisational Melodic Structures that I use in my teaching. If we teach students to create beautiful melodies and communicate when they solo, they will learn to love improvisation and will strive for excellence in music.